A modest table adorned with only a small globe separates Julia Trujillo Luengo from her guest and local coffee shop owner Mateo Hodo as the house lights dim and the cameras start to roll at the Portland Media Center. Over the next half hour, Trujillo, director of the city’s fledgling Office of Economic Opportunity, which was launched last year to better integrate new Americans into the Greater Portland economy and community, casually talks to Hodo, who came to the U.S. in 2002. The series of topics ranged from his childhood memories of growing up and going to school in Albania to traditions that his family continues to keep here in America. “I had school, a little bit of play and then work,” Hodo recalled of being a 10-year-old boy in Albania, where his parents owned a neighborhood grocery store. He came to the U.S. at the age of 15 with his family after his mother won the visa lottery. Now, he and his wife own Coffee Me Up on Cumberland Avenue. 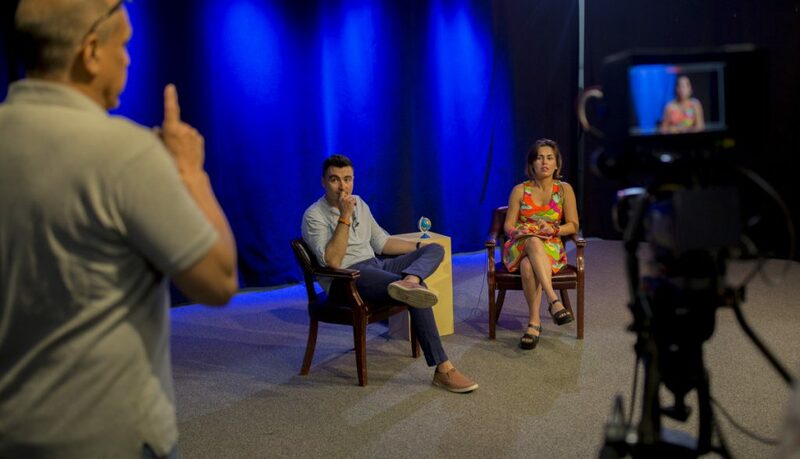 It’s the first taping of “Global Connections,” a new show that will begin airing soon on community television. It’s based on a popular show in Spain called “Spaniards Around the World,” which traveled to Portland last fall to feature Trujillo, who is from the Canary Islands. The television show is just one of several initiatives being rolled out in the coming weeks and months by the Office of Economic Opportunity, which was established by the City Council in December 2016. In its first year, Trujillo, who was hired last May and remains the office’s only employee, has been busy laying the groundwork for efforts designed to better integrate new Mainers into Greater Portland’s economy and community. Much of the first year has been spent pursuing grants and building partnerships and pilot initiatives. Over the next two weeks, the office is co-sponsoring a series of four workshops for aspiring immigrant entrepreneurs. At the end of June, it plans to roll out a game designed to educate the immigrant community about community resources available to help them learn English and find employment, case management and other services, while also collecting baseline data for a strategic plan. And in partnership with the Portland Regional Chamber of Commerce, the office will host a training session next month for companies interested in making their application process and workplaces more inviting and welcoming to new Americans. Then, in the fall, the office plans to launch a professional networking opportunity to connect talented immigrants to people in their industry and release its strategic plan to help new Mainers find jobs that match their education and experience in their home countries, rather than working as hotel cleaners and dishwashers. “There’s a level of disconnect in that the employer doesn’t always know 100 percent how to connect to this talent pool, and this talent pool hasn’t always been successful in securing the best possible opportunities,” said Trujillo, who has experience working with immigrant populations as director of the Maine Department of Education’s Migrant Education Program and more recently as the director of the Maine Office of Multicultural Affairs and the state’s refugee coordinator. Some policymakers and economists see new Mainers as an opportunity to thaw the so-called demographic winter – a term used to capture the reality that Maine is one of the oldest states in the nation with one of the lowest birth rates, and is a state that has trouble retaining young, talented workers. This, coupled with a low unemployment rate, is making it difficult for companies to attract and retain skilled workers. According to the New Mainer Welcome Center, which is part of Portland Adult Education, nearly 80 percent of program participants in the last two years have an undergraduate or graduate degree. Common barriers for employment not only include English proficiency, but also a lack of understanding of career paths, transferring credentials, U.S. standards for resumes and interviews, and cultural norms in U.S. workplaces more generally. The city’s Office of Economic Opportunity was envisioned as a way to convene existing service providers and improve communication and coordination, while reducing duplication and bridging any gaps in services. It was not intended to be an employment agency, per se, though Trujillo has been doing some of that as well, including connecting more than 15 people with jobs at Ready Seafood. For example, Wex, a payment processing firm that is building a new headquarters on the Portland waterfront, was searching for information technology professionals, and Khalil Ismayilov, who came to the U.S. two years ago from Azerbaijan, had that experience and was looking for work. So Tarlan Ahmadov, the refugee resettlement coordinator for Catholic Charities who knew Ismayilov, turned to Trujillo. She checked out Ismayilov’s credentials and made some formatting suggestions for his resume. She also helped Julia Clukey, a recruiter at Wex, feel comfortable knowing that the foreign credentials met the company’s high standards. Ismayilov was hired as an IT specialist last month. “I’m really thankful for all the people who put all their best (effort) to make it happen,” the 30-year-old said. Clukey said the office was key to helping her compare foreign and domestic credentials. “It’s preparing both sides to really understand the differences so we’re not overlooking talent,” she said. The office was approved by the council in December 2016 and given a budget of $260,000, much of which councilors hoped to fund with grants. It was anticipated to include two program managers, but grant funding for those positions has been elusive. During recent budget discussions, councilors considered increasing business licensing and permitting fees to raise additional revenue for workforce development initiatives, including staffing for the office or additional funding for Portland Adult Education. City Councilor Justin Costa said the Economic Development Committee, which he leads, will receive an update on the office’s progress in the coming months, before deciding whether additional funding is needed. Since being hired last May, Trujillo has partnered with the chamber of commerce to secure one of four national Gateways for Growth grants, which is providing $12,500 in financial aid, technical assistance and data about immigrant communities and contributions in Portland. The grants, sought by 45 applicants nationwide, are funded by the Partnership for a New American Economy and Welcoming America. The grant will also allow the office to develop an action plan by this September. Between now and then, the grant also includes a report about immigrant communities in Portland and the Greater Portland region, including education level, country of origin and how many own their own businesses. That report should be ready sometime in June. It’s also allowing the city to develop its own game to help gather data about immigrant needs, as well as educate new Mainers about community resources available to them. Participants will answer a series of questions, each of which provides a new set of opportunities for the user. At the end, the user will be provided with a printout of community resources that they may not have known existed. And the city will better understand what services may be lacking. The game will be available to Portland Adult Education students for about a month, Trujillo said, and could be used to measure the progress of these users. Another initiative, Greater Portland HIRE, which also involves the chamber, was announced at a recent Eggs & Issues breakfast forum. In addition to the July training workshop for human resource professionals, Trujillo plans to launch a professional networking group this fall so immigrants and Americans can better connect. The networking event is based off a similar program in Halifax, Nova Scotia, she said. “They have strong data backing them up that it has resulted in many jobs,” she said. After a year of behind-the-scenes work, it appears many of the office’s efforts are ready for prime time – much like Trujillo’s new TV show. “We have a pretty busy summer ahead of us,” she said.